The study looked at the flow of donation pages on each of the nonprofits websites as well as email appeals, follow up emails, etc. Here are some of the key findings. 65% required users to go through three or more pages to actually donate. Forcing users to go through multiple steps is one of the fastest ways to lose donors. 84% of donation pages were not opimized for mobile, which made it hard for mobile users to complete a donation. 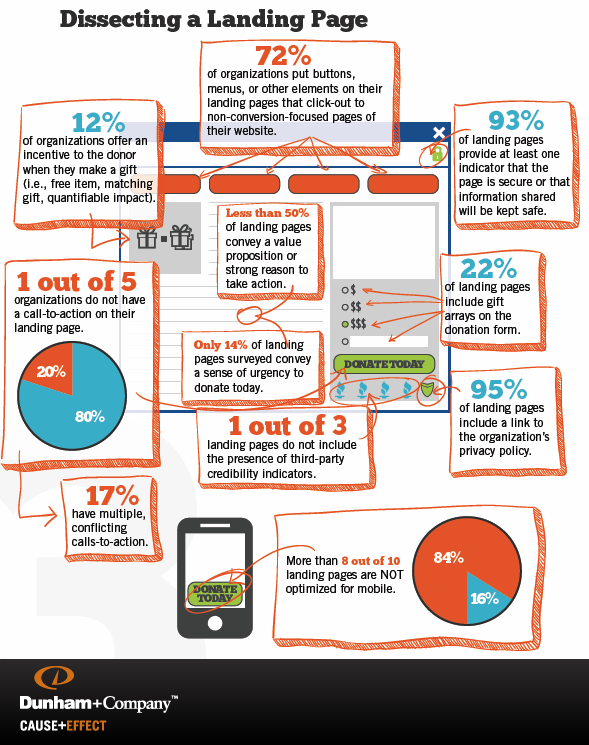 63% offered no action opportunities on their thank you page or emails. 37% of organizations did not engage in any communications with new subscribers within the first 30 days. How welcoming! 79% did not personalize emails with with a name like "Hi Allyson." The report is troubling because the nonprofit community has been doing online fundraising for years and there are established best practices for optimizing conversions. Here are some tips that I'm re-sharing from another Frogloop blog post from 2010 that are still the gold standard. Tell people what you want them to do quickly. Be clear how their donation will make a difference. One tactic that has been successful for the nonprofit CARE is to provide their donors with two simple pie charts that illustrate how funds raised are allocated below the credit card donation form. Also give people several options to contribute money – one time giving, monthly giving, etc. Many organizations have a welcome series to introduce new donors to their email list. This is a great strategy that your organization should consider adapting. If your nonprofits, does not have time to do this right now, just be sure you send them at least one email welcoming them to your community and the different ways that they can get involved. Try to communicate with your list at the very least once a month. You nonprofit will raise more money by telling compelling stories that resonate with real people. Donors are human beings (not ATM machines) and they need to feel connected to your organization and to your story. Save your press releases for the media, and your “talking points” for policy makers. Organic Cultivation: via your own website, events, social networking sites, direct mail, etc. Paid Acquisition: Online acquisition (like Care2) Google Ad Words, email appends, chaperoned emails, etc. The best way to reach your donors is to connect with them wherever they are – which means everywhere. Make sure you cross promote your fundraising campaigns across multiple channels such as your website, email appeals, social networks, direct mail, telemarketing, etc. Also be sure that the content is edited for each channel since each one has its own unique tone and voice. As I mentioned in Five Fundraising Tips to Add to your Checklist, querying and segmenting your online membership may not be a ton of fun, but it’s vital to the success of your online fundraising program. You need this information to tailor appeals to different segments of your list. Why would you send members of your list who have never donated to your organization the same exact appeal to members who have donated $250 3x in the past 12 months? These two audiences are connected to your nonprofit very differently and therefore should receive different appeals that match their level of engagement. Don’t forget to thank your donors and tell them if you met your goals. This simple strategy has proven to help build better relationships with donors. Also make sure you include any compelling stories, successes, or photos so donors feel that their donation made a difference. Open Rates: What percentage of people opened up an online fundraising appeal. Unique Web Visits: How many unique visits to the landing page. Conversions: What percentage of people who clicked on the donate link, donated money. Click-Through Rates: How many people clicked on a donation link.